The NFL frowns upon this kind of behavior for some reason. My friend Jeff and I once attended a Browns exhibition game at Cleveland Municipal Stadium, that charming old wreck of a field famous for its rabid fans. We sat in the bleachers behind the east end zone, a section affectionately known as the Dawg Pound, from where the rowdiest members of Cleveland's fanbase would hurl dog bones, snowballs and harsh language at opposing players. My impressionable teenage self took in the unruly activities of my older neighbors with juvie-hall glee. Half-crocked fellows wearing Bernie Kosar jerseys passed around illicitly smuggled cans of beer. One guy openly smoked a joint, a sight heretofore seen only in ABC Afternoon Specials about the evils of marijuana as a gateway drug. Men spat, men swore, men gave out high-fives to guys walking by only to pull them into the crowd for unwanted noogies. It was awesome, or so I thought back then. Unfortunately for people who treat NFL games like an underpants-on-the-head style frat party, the NFL doesn't think bad behavior is too cool, and is cracking down like never before to put a stop to it. This year, the league is requiring any fan who gets ejected from a game to take a four-hour online course on alcohol abuse, anger management and crude behavior before being allowed to return to the stadium.. Failure to comply could result in arrest if the offender is found on stadium property. Not only must booted patrons take the course, they get to pay up $100 for the privilege of being psychoanalyzed for telling the guy in the Steelers jersey that his mother exchanges sexual favors for bus tokens. The policy, an extension of the conduct code implemented by the NFL in 2008 to quell disorderly behavior, has its share of critics. Some wonder how teams will keep track of ejected fans from week to week. Others complain about giving power to an usher or security guard in deciding if the guy passed out in his seat stays or goes. These are fair questions that should be addressed, but not at the expense of ignoring the problem. 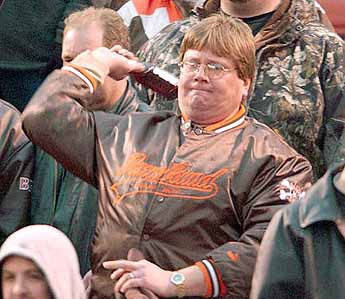 In Cleveland and other cities throughout the league, stories of rampant fan stupidity are far from uncommon. From your ordinary drunken loutishness to truly scary stuff like the two men who were shot at a 49ers-Raiders preseason game last August. The NFL's conduct quiz asks questions like this: "True or false: Behaving badly towards other fans, such as fighting, swearing or threatening them, is OK as long as they deserve it." If you can't answer "false" to such a simple query, maybe you don't belong at a game. This is kindergarten-level common decency here. Fighting, aggressive taunting and over-the-top drunken behavior should all be zero-tolerance offenses, while fans standing at games (a common complaint at Cleveland Browns Stadium) should get a much longer leash. The league wants its fans to feel safe in light of the growing perception that football games are a perilous place to take children. The Cleveland Browns website asks stadium-goers to "please be courteous and respectful to those seated around you and refrain from behavior that interferes with others' ability to enjoy the event." Follow that simple piece of advice, and there will be nothing for fans to worry about. Otherwise, they may find themselves on the outside looking in, and rightly so.